The Sport-Tek Zipped Pocket Anorak Style JST65 is available in Adult Sizes: XS-4XL and may be purchased in your choice of the following colors: Black/Black, Black/True Royal, Black/True Red, Graphite Grey/Black, and True Navy/White. 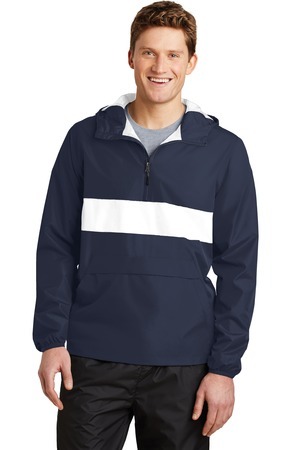 SKU: SM-JST65 Categories: Activewear, Basketball Warmups, Jersey, Men's Basketball Warmups, T-Shirts, Outerwear Tags: adult activewear, adult anorak, adult clothing, adult jackets, adult rainwear Brands: Sport-Tek. The Sport-Tek Zipped Pocket Anorak Style JST65 is available in adult sizes: XS-4XL and may be purchased in your choice of the following colors: Black/Black, Black/True Red, Black/True Royal, Graphite Grey/Black, and True Navy/White. A zipped pocket keeps valuables accessible and secure in this element-beating anorak. Two pockets in one: front pocket includes a top zippered pocket to secure valuables.